Much noise has been made and continues to be made about Nigeria’s magic auto policy. By the way, I found what I think is a copy of the policy at the National Automotive Council’s website here. Nothing new in there except that I found an admission that prices will rise (page 105) even though the government continues to deny it. There’s also a lot of exclamation mark usage as if to drive home the point. But that is neither here nor there. The National Automotive Council on Tuesday announced that plans had advanced for about 30 vehicle manufacturing plants to open business in the country.The Director, Policy and Planning, Lukman Mahmud, said this was in line with the Federal Government’s plan to ensure local production of vehicle components begins in-country.The arrangement would ensure the distribution of vehicle parts through the Nigerian automotive industry at competitive prices, to create employment opportunities for the people.Prior to the introduction of the National Automotive Industry Development Plan by the Federal Government in 2013, the country had 14 existing plants at different locations in the country.According to Mr. Mahmud, the provision of incentives and protection to the industry under the new auto policy persuaded 16 fresh companies to establish their assembly plants in the country. This is fantastic news indeed. Especially because many countries are dying for this kind of investment. As I have said previously, some countries actually bribe car manufacturers to come and setup plants in their country. In terms of investments, a vehicle manufacturing gig is one of the best ones a country can hope to have. It’s not just the jobs it creates, but the quality of those jobs as well. Workers get trained in very useful skills and a single vehicle plant can be the economic lifeblood of a town for decades. Here in the UK, if you take Nissan out of Sunderland, devastation is what you will get in its wake. Yet Nigeria, simply by publishing a document, is now in danger of being overrun by so many manufacturers who want a piece of the action. 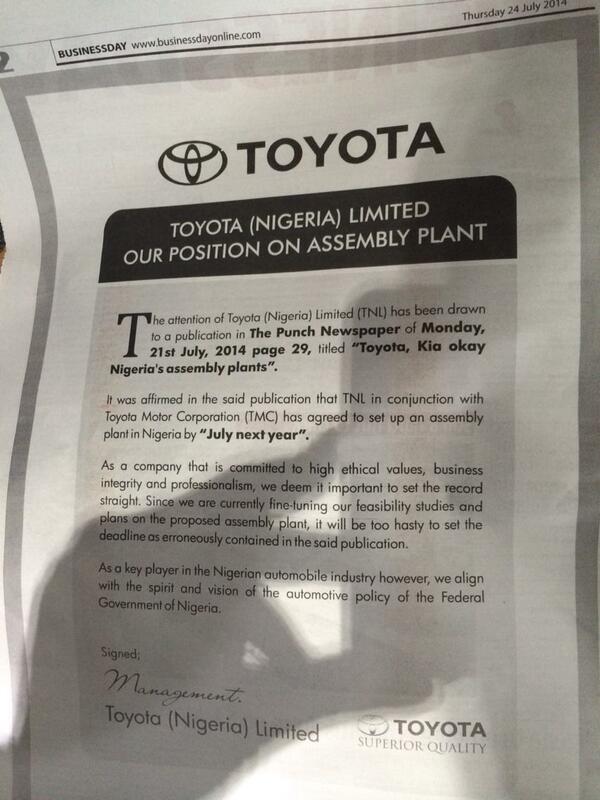 The fact that Toyota felt the need to publish a disclaimer in the papers need not detain us here. They are simply haters who wont know a good investment if it landed on their lap. Be that as it may, I want to do a quick comparison around the world of investments in car plants just so we know what we are getting in Nigeria. That way if, God forbid, things don’t go according to Aganga’s plan, we can at least know where things went wrong. As we know, Nissan has been the first out of the blocks to start ‘making’ cars in Nigeria under the ‘Proudly Nigerian’ slogan. Thankfully, when carmakers announce new plants in a country, they tend to issue a press release about it which summarises their plans and what they hope to achieve. With that in mind, let’s sample some Nissan announcements. Nissan will invest R$140 million in the construction of the engine plant and will generate approximately 200 direct jobs. The industrial unit will use an existing building adjacent to the Vehicle Plant and will begin its activities with the production of the 1.6-liter, 16V I-4 flexfuel engine, with 111 hp and torque of 15.2 kgfm – when using ethanol – one of the most efficient in the Brazilian market. The local production of engines makes the project of Nissan’s Industrial Complex in Resende a complete center. With investments totaling R$2.6 billion (U.S. $1.5 billion), the industrial unit will be one of Nissan’s most sustainable in the world, and will originate in 2014 two Brazilian cars: Nissan March and Nissan Versa. Nissan today announced the opening of its second production plant in Thailand. The new plant will be a production hub for the NP300 Navara, Nissan’s new generation pickup truck, destined for export to 45 countries around the world. Thailand is a key market for Nissan, an integral part of their growth strategy in Asia. The country now boasts two plants and an R&D facility, and is increasing in importance as the company’s Asian hub for exports and manufacturing. Nissan has invested 3.7 billion Thai Baht ($116m) in the 580,000 square meter facility, bringing with it 2,000 new job opportunities. Full production capacity is expected to reach 150,000 units per annum. Renault-Nissan CEO Carlos Ghosn and Daimler CEO Dieter Zetsche announced today that their companies have agreed to establish a 50:50 joint venture, the business entity that will oversee construction and operation of the new plant in Aguascalientes in north-central Mexico. The new plant will be built in the immediate vicinity of an already existing Nissan plant and will have an annual capacity of 300,000 vehicles when fully ramped up. Start of production is planned for 2017 with Infiniti models. The production of Mercedes-Benz brand vehicles will follow in 2018. Nissan today inaugurated its new manufacturing facility in Indonesia. The second plant in Purwakarta, Indonesia, represents an investment of 33 billion yen (US$325m) and is a significant step forward for Nissan to become a leading brand in the country. The investment is also an important part of the company’s market expansion plan stated in its six year mid-term business plan, Nissan Power 88. The 60,000 m2 facility includes body assembly, paint, trim and chassis operations. With the expansion, Nissan increases its production capacity in Indonesia from 100,000 units per year to 250,000 at full ramp-up. The new plant will generate up to an additional 3,000 jobs in the region. Dongfeng Motor Co., Ltd. (DFL), Nissan’s joint venture in China, today announced it will build an all-new manufacturing facility in Dalian, Liaoning Province, China with an investment of up to RMB 5 billion (USD $800 million). The Dalian plant, scheduled to begin manufacturing NISSAN-branded passenger vehicles, will have an initial annual production capacity of 150,000 units by 2014, and will expand up to 300,000 units. Nissan is targeting a 10% share of the rapidly growing Russian market by 2016 (up from 5.9% today) which will be achieved by tripling annual sales from the 2011 total of 161,000 units. To support this, capacity at the St Petersburg Plant will double to 100,000 units in 2014FY The announcement follows last year’s capacity increase at the plant which currently manufactures the Teana sedan, X-TRAIL SUV and Murano crossover, to 50,000 following the introduction of a third production shift. The plant at Oragadam, spread over an area of 640 acres, represents an investment of 45 billion Rupees ($990 million) and the capacity to produce 400,000 units per year at full ramp up. Today, the plant employs 1,900 workers and will reach 3000 in two years time. The company, along with its supplier park in Chennai, estimates a total of 6,000 jobs to be created in the region. Nissan today became the first major manufacturer to build a car in Nigeria in response to the introduction of the new Nigeria Automotive Policy. The inaugural vehicle, a Nissan Patrol, rolled off the production line at the Lagos assembly plant, marking a key milestone in the company’s continued wave of expansion into high-growth markets. Nissan is targeting significant growth in Africa as the company builds momentum towards achieving its Power 88 goals, a commitment to reach 8% profitability by the end of fiscal year 2016. Elsewhere in the world as part of the high-growth markets strategy, plants have been opened in Mexico and Brazil with projects underway in Indonesia, Thailand and China. Last year Nissan announced it will be the first manufacturer to build cars in Myanmar, after the opening up of the economy in the south-east Asian country. The first “built in Nigeria for Nigerians” Nissan Patrol follows the signing last year of a Memorandum of Understanding for vehicle assembly in Lagos between the Renault-Nissan Alliance and West African conglomerate Stallion Group. Since then, preparing for production in Nigeria to global production standards has been achieved at a rapid pace, setting a new benchmark in responsiveness and organisational agility. The rollout of the first Nissan vehicle comes shortly after confirmation that Nigeria’s booming economy has now overtaken that of South Africa. Africa’s most populous country is pivotal to Nissan’s mid-term growth plan, which seeks to double sales on the continent by FY2016, up from 110,000 units at the end of FY2012. Nissan’s growth strategy in Africa gained momentum with the introduction this year of Nigeria’s new Automobile Industrial Policy, aimed at stimulating development of the auto industry in the country. “We are grateful to the Nigerian government for implementing automotive legislation that is conducive to investment and that was instrumental in our decision to open an assembly plant in partnership with the Stallion Group, already our exclusive distributor in Nigeria,” added Whitfield. Nissan anticipates vehicle demand to increase in this oil-rich country, which is seeing a rise in fast-growing industries including finance, retail, communications and film. Hmmm. What’s going on here? Where is the money? From what we can see from all the examples above, a car plant is a serious investment and costs a lot of money. And Nissan never fails to tell you how much it has invested or plans to invest in the future. But these rules have been suspended in Nigeria – without investing anything, Nissan has managed to roll out cars ‘built in Nigeria for Nigerians’. There is no mystery here – no investment has been made in the country. This auto policy has handed them a captive market without any upfront commitment from them in terms of hard cash. Nigerians should remember this in future when they are tempted to complain about ‘foreign companies ripping us off’. If you were Nissan, would you do different? Simply by removing the tyres before importing and then adding them back when the cars land in Nigeria, you have qualified as a ‘car manufacturer’ in Nigeria. Even the plant where this ‘assembly’ is going on in Lagos was already assembling buses long before the noise of this ‘auto policy’ started. It’s not even the end of the world if things like this happen. Anyone is free to come and build cars in Nigeria without investing anything. Good luck to them. But to make a song and dance about how your ‘policy’ is causing a stampede of investors and then – adding insult to injury – raising tariffs on Nigerians in the name of this briefcase investment is completely ridiculous. When you see carmakers coming to invest in Nigeria, you will know. And the government will need to back up such investments with more than a badly written piece of paper. As usual, we have turned a serious matter into a joke. Something which costs hundreds of millions of dollars in other countries has ‘transformed’ into a thing so trivial that 16 manufacturers are coming to Nigeria to just be littering the country with car plants. We know how this movie is going to end. Around the 4 minute and 20 second mark, you hear him say ‘we should not do things just to get attention‘ in reference to the auto policy. Or perhaps the minister. Maybe this is what this is all about then. In which case, nothing much to worry about as the policy will probably die a natural death after the elections next year. Vote wisely because your vote will not be refunded if you hand it to anyone on the expectation that 30 car plants are going to start production in Nigeria. Simon Kolawole is back pushing his argument for the justification of phasing out 32.5 grade cement in Nigeria. In his latest backpage column for ThisDay, he tells us how a part of a building site behind his house collapsed last week Friday. As is the case when these things happen, it’s always a tragedy and people are injured if they are lucky enough not to lose their lives. Recently, when I added my voice to the clamour for the standardisation of cement in Nigeria from 32.5 megapascals (mpa) to 42.5 mpa – which industry experts say is far better because of its setting strength, yield and adherence capability – I was shocked at the fierce opposition by some Nigerians. Not even evidence from across the world that 32.5mpa cement was going out of fashion could convince the critics. Some even rejected the proof that India and China had decided to entirely phase out 32.5mpa from the construction industry – either for plastering or concrete work. This is the typical watery stew argument that Mr Kolawole is fond of serving his readers in ThisDay. Yes, Simon, it makes sense. It’s interesting that people who opposed this move have now become ‘blackmailers’ in the book of Mr Kolawole. For having a different opinion? Wonders. Once you start hearing people say ‘there’s nothing to lose’, it’s a good sign that you are the one going to pay for the experiment, not them. What is the ‘proof’ from China that he’s speaking about? It is true that in January of this year, the China Building Material Academy announced plans to phase out the 32.5 grade of cement this July. Why are they doing this? The answer to this question is very important because it helps to illustrate how Nigerians copy policies from one country and by the time it arrives in Nigeria, it is something completely different yielding the opposite result. 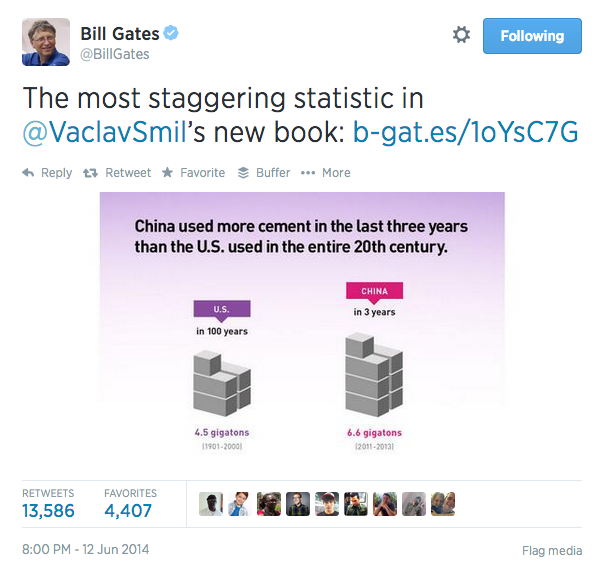 As statistics go, that’s one of the most staggering we’ve seen in recent times – in just 3 years, China used more cement than the US did in 100 years. How did this happen? A basic understanding of the Chinese economy lets us know that the Chinese have ‘over-invested’ in a lot of areas. The kind of investment that has gone on in China in recent years is unprecedented in human history. To achieve this kind of staggering cement output, they have been expanding output for years. No expensive degree in economics or business is required to understand that when a company invests $1 back into the business, that is $1 that cannot be consumed by shareholders. In other words, for the owners of the business, the more a company invests, the longer it takes for them to realise a return on their investment. The game gets longer and longer. 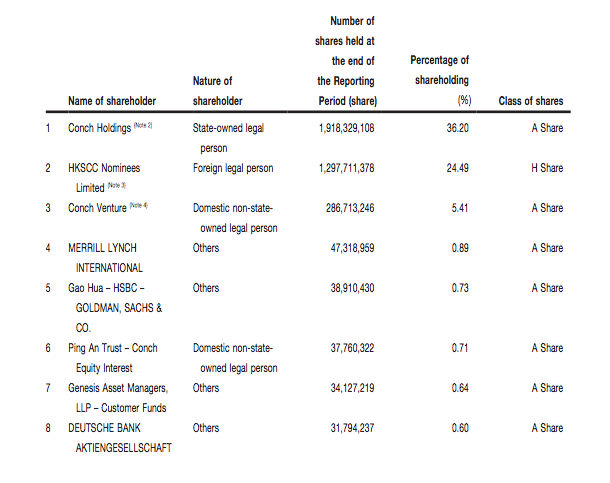 The biggest shareholder is the state-owned Conch Holdings. No point going through all the other big players – the pattern will be the same. The SOE model of China invests in different companies and allows them to compete fiercely against each other. This is the answer you will find almost everywhere – in an industry with 3,000 players producing a ginormous amount of cement, the government wants to reduce competition so it can start to make returns on its huge investments in the sector. Most of the smaller players in the industry produce 32.5 grade which is of course easier to manufacture. By getting rid of the smaller guys, the big guys who have spent enormous amounts to increase their capacity can gain a larger share of the market and deliver better returns. If Mr Kolawole has any other sources that show that 32.5 grade is being phased out in China over safety concerns, he should kindly share it and educate the rest of us. This is how we Nigerians see a medicine that was used to treat depression successfully in one country and then bring it to Nigeria to treat malaria. For Mr Kolawole, it is enough that China is phasing out 32.5 grade cement. There is no need to interrogate further, Nigeria must do the same thing. ARE YOU A BLACKMAILER AND DENIER OF PROOF?! Or do you not want Nigeria to be like China? And yet, not only are our industries completely different, the problems being solved are two completely different things. In Nigeria we barely have 2 serious players in the cement industry and one controls over 60% of the market. We are nowhere near the kind of market that should be reducing choice and competition for any reason at all. Until prices start to come down and cement manufacturers are no longer making 50% profit margins, we should look to increase competition. We have so many houses to build and complete. Yet it does not matter to Mr Kolawole that he probably lives in a house built with 32.5 grade cement or works in an office built with the same 32.5 grade or the reality that 99.9% of buildings in Nigeria do not collapse. Something must be banned. And of course since Aliko Dangote has said it, how can it be wrong? No doubt about it, even one collapsed building is almost always avoidable. But this should lead us to ask serious questions as to why many many buildings built with the same cement do not collapse and some do. How can it be the cement? The proof that Mr Kolawole is ignoring is how this whole move has been an elaborate puppet master scam. I have documented in a previous blog post how this all began with one ‘Tunde Ojo’ and a faceless coalition of civil society groups in the civil construction industry in February of this year. This ‘Tunde Ojo’ has since disappeared, along with his coalition, from the face of the earth. Nigerians are being strung along and of course people like Mr Kolawole do not want buildings to collapse near them. This banning of 32.5 grade cement is the surest way to take a problem that affects a small number of people – each one a terrible tragedy – and spread it across the whole population. In the name of keeping Nigerians safe, their pockets will now be picked even more forcefully by the same people who are already selling them cement at 3 times average global prices. The deed is of course now done and there’s almost no turning back. But it’s useful to understand that even as powerful as government and its crony capitalists friends are, it still needs journalists like Mr Kolawole to shill for them with emotional arguments containing approximately 0% logic. This is the real tragedy. When the government, business and regulator are all in bed together, the only hope is the press. No one is asking Mr Kolawole to accept or reject the argument against 32.5 grade. But for Pete’s sake, dig a little deeper into the arguments and let your readers come away from you more educated. What we are getting is an eagerness to ‘conclude the matter’ in favour of Aliko Dangote and co. I sent someone to a barber shop nearby just to hear what they are saying about my governor there. He said the barber was just complaining about how the governor is not giving them money. When they now pointed to a big school opposite his shop that the governor is building, he said ‘is it the school that we will eat? That was a friend of mine who works in one of the South West states in Nigeria in the wake of Fayemi’s loss in Ekiti. It is hard to escape the feeling that Fayemi’s loss has left a lot of incumbents feeling uneasy because they fear that the issues which toppled him are not unique to Ekiti. There is a Mekunu Revolution afoot and it threatens to consume any politician who stands in its way. But what is it all about? The answer likely lies in the way politicians have been reacting to whatever it is. Ado Ekiti — Ekiti State Governor Kayode Fayemi yesterday went back on the decision of government to organise the controversial Teachers Development Needs Assessment (TDNA)for teachers in the state. Fayemi also announced the decision of his administration to commence payment of the 27.5 per cent Teachers’ pecuniary allowance. Edo State Government has reversed the planned competency test for teachers in the state and recalled the 936 teachers whose names were deleted from the payroll over certificate discrepancies and age falsification. OGUN State governor, Senator Ibikunle Amosun, has approved car and housing loans for civil servants as a way of boosting their morale and efficiency at work. Amosun also promised to implement 27.5 per cent Peculiar Allowance for teachers, as well as payment of outstanding allowances. ‘Oja Irorun,’ a farm produce market for public servants constructed by the Ogun State government, has been established at the state secretariat, Oke-Mosan, Abeokuta. The Head of Service, Mrs Modupe Adekunle, while declaring the market open, said it was an avenue for civil servants to shop with ease. Mrs Adekunle noted that the market would be opened every Friday and would enable workers to purchase fresh farm produce, which would improve their healthy living. In addition to all these there are the well worn complaints from Ekiti that Fayemi gave contracts to ‘outsiders’. This is now reverberating in Osun State where Ogbeni Rauf is being accused of hiring the ‘foreign’ Sam & Sara to set up the Omoluabi Garment Factory in Oshogbo to produce school uniforms. Sam & Sara, the complaint goes further, then went on to perpetrate the dastardly crime of hiring Igbos (who are not Nigerians) to staff the factory. 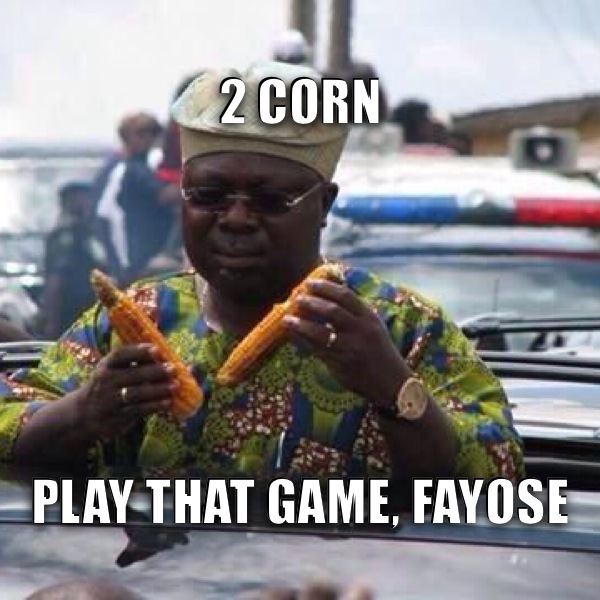 To make matters worse, Ogbeni’s opponent, Senator Iyiola Omisore, unencumbered by any morals, scruples or underpants, has been playing up his ‘man of the people’ credentials by making sure he is photographed riding shotgun on a motorcycle, eating roasted corn and guguru (a derivative of corn, it must be noted). Does it matter that the man is wearing what looks very much like an Audemars Piguet watch on his wrist? Afterall, the watches have a starting price of a mere £12,500. What does this all mean for our democracy? I fear things are not looking good. For starters, the electorate seem to be sharply dividing into ‘the masses’ and ‘the elitists’ who cannot drink their coke without a dash of lime in it. The whole point of running for office is quickly boiling down to the question – na who grassroots pass? Yet, and for personal reasons, I feel this is all sadly very wrong. I am by no means a rich man today (infact if you were to offer me some money today, I will happily relive you of it) but only a few years ago, I experienced what it felt like to be desperately poor. I was raised by my mother, almost single-handedly, and anyone who grew up in the same shoes will know how difficult, and often impossible, that task is. While I was in University in Nigeria, my Mother went through a terribly difficult financial period where my ability to continue going to school was under serious threat. In the end, an Uncle came to our rescue and the evil day was averted. Perhaps you might not be reading this blog post if things had turned out differently. The emphasis is mine because ‘foreboding’ is exactly the word to use to describe the kind of poverty I knew. If it goes on for too long, people begin to think it is permanent state of affairs and cease to think about tomorrow. I recall reading a story some years ago which tried to explain why the January 2010 earthquake in Haiti killed 220,000 people. One of the reasons given was that there was so much foreboding in the country long before the earthquake that people could not be bothered to put basic fortification in their homes. Something was bound to come and kill them anyway so why not spend the money on something else? When you begin to hear people asking if they are to eat the roads and schools provided for them, you are seeing a dangerous sense of foreboding. In our case as a nation, this foreboding has been caused by years and years of mindless theft and squander of our commonwealth by people who pretend to be our leaders. What the ‘common man’ sees is a system awash with naira and dollars and he cant seem to find a way to lay his hands on any of it. The people no longer want schools; they want money in their pocket. They do not really care if a school or road is built properly – they want it to be built by a local contractor who will ensure they get some of the money. All this requires is for a politician to promise to do these things and he will get a hearing. Predictably, where leadership is required, our politicians, who had no convictions to begin with and have spines made of chocolate, have utterly capitulated. 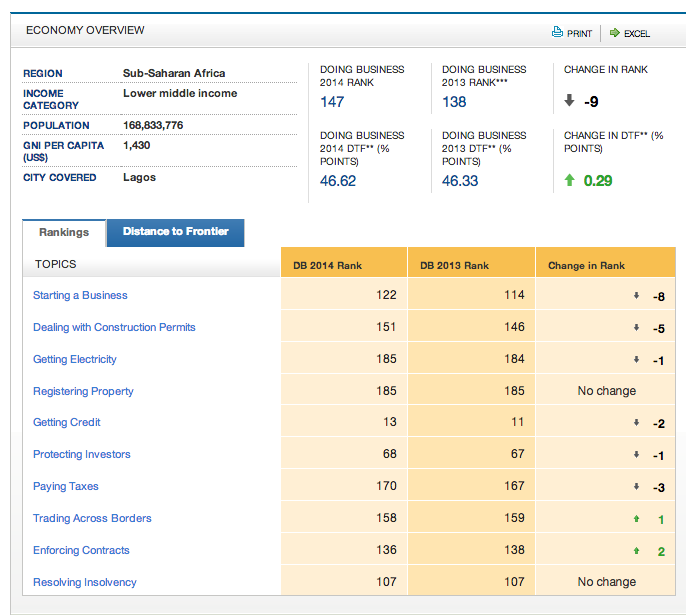 Was there no reason in the first place why construction contracts were given to reputable (the other name for ‘outsiders’) firms? A bad contractor is a bad contractor, period. This is an opportunity for governments to crackdown on those who do terrible jobs and use that as justification for the decisions they make. Is there no cost to bad teaching? Why were the reforms instituted in the first place? Is there any more evidence required for teaching reform than looking at the shambolic state of our education which does not equip anyone to solve the problems facing us as a nation. And surely, there are people who have benefitted from these reforms – where are they to act as cheerleaders for it? It is not that ‘the masses’ are stupid and do not know what they are doing. Far from it. I think that those who exchange their votes for money know exactly what they are doing. There is a foreboding and the people want to take their payment upfront or perhaps ‘eat their seed corn’. Why be patient with a politician who promises reform when chances are that he is lying and stealing anyway? There will be no tomorrow. Where is this Mekunu Revolution leading us? I do not know for certain but I doubt it’s a very good place. But the biggest message in all of this is that we now have a pretty good idea of how the vast majority of the population are against any kind of meaningful reform even if they all have different reasons for their opposition. Once upon a time, Baptists and Bootleggers in America were on the same side supporting alcohol prohibition too, as implausible as it sounds. We can remain like this as a country for many many years to come.